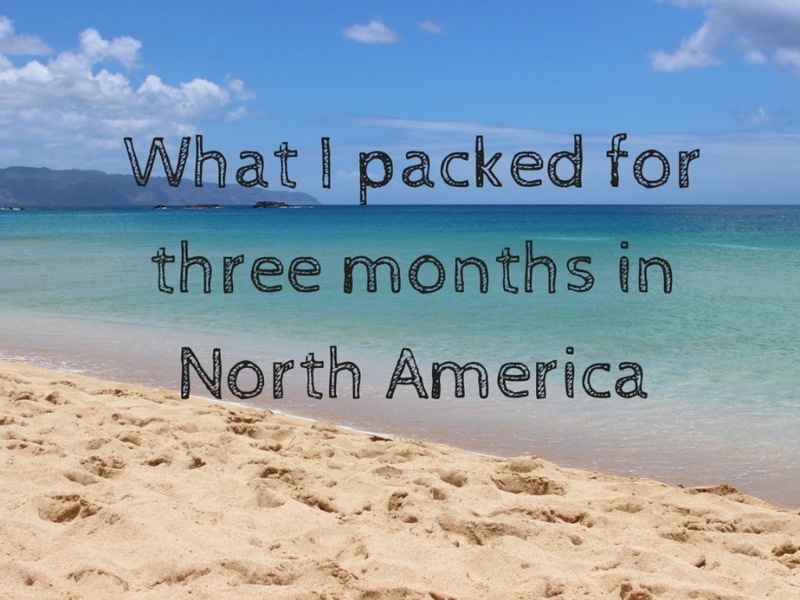 This summer packing list is for the first of three segments of my one year of travels, taking me from the humid Pacific Island climate of Hawaii to the chilly temperatures of Alaska and northern British Columbia. A lot of fun but difficult to pack for if everything needs to fit in a 40L backpack and a 10L day pack. But not impossible. I used to travel with a 60L backpack. I will never do that again. I have a slight frame and I could barely carry the thing. It was agony when I had to walk more than a few metres and I’m sure it wasn’t good for my back. Downsizing to a 40L was one of the best travel decisions I have ever made. I do think there is a time and a place for a suitcase and I use a small carry on for short trips and a larger suitcase if I know we have a car or we aren’t moving around much but for backpacking trips, I always use a backpack. I’m sure some of you may disagree with me when I say that if you have a 40L backpack or smaller, it doesn’t matter so much if you don’t get the best brand on the market as you’re not going to be carrying the same weight you would be with a larger backpack. I paid US$50 for my North Gear backpack in 2012 and although a couple of the toggles have broken (these could easily and cheaply be replaced but I am lazy) it held up great when I took it through the Americas for 13 months and on shorter trips since then. It is lightweight, comfortable and works for me just fine. My day pack was US$15 and I have been using it a lot since I first got it for travel as well as Sydney walks and it is still in perfect condition. But anyway, you probably want to check out my summer packing list now right? Well here is the low down. I found that if I roll my clothes and wear my hiking boots (or attach to the outside of my pack) on travel days then everything fits. My pack is top-loading but I can access the bottom too as there is a zip. I keep all my underwear items in a cotton bag so they are easy to find. This summer packing list may like seem like a lot of stuff but it all fits comfortably in my backpack with a bit of room to spare, especially since I ditched my paperback book that I was carrying around for the first couple of days. I like having a small handbag to carry my everyday stuff in and this small leather one has done me well. Since leaving Sydney I bought one more singlet and another short dress in Hawaii, and I bought another singlet in Seattle. I still want to buy a thin woollen jumper when I am in Vancouver and maybe some Toms or Converse sneakers for the cooler nights nearer the end of my trip so I won’t have to wear my hiking boots all the time. I should just be able to squeeze the extra stuff in my bag. A week into my trip, I am really happy with my summer packing list and that I packed more dresses this time around as they are what I wear most in my every day life. I am also so glad that I bought Birkenstocks as I can walk for hours in them without getting sore feet. So there is is folks, my summer packing list for the next three & a half months – only two small bags. I have to say it feels great to be carrying around so little. What do you think of my summer packing list? Would there be anything else you would add or anything you don’t think you would need?